It’s Esco here and I’m totally done with my Kanye hiatus and I’m back on the blog to give the people what they want, and what they want is “The Must Pick Ups of the Weekend!” I’m pretty much done enjoying the summer for myself, so I’m now here to dedicate my time to help the visitors of FLT to stay fresh for the rest of the summer. What other way to do that other than letting my fellow FLTers know what’s going to be dropping for the weekend. There’s a solid lineup for this weekend actually, and let’s not waste any more time than I have already, let’s get to it. First up is a unique drop from the Jordan brand that is the third installment of the 3LAB5 colorway that they have been doing. 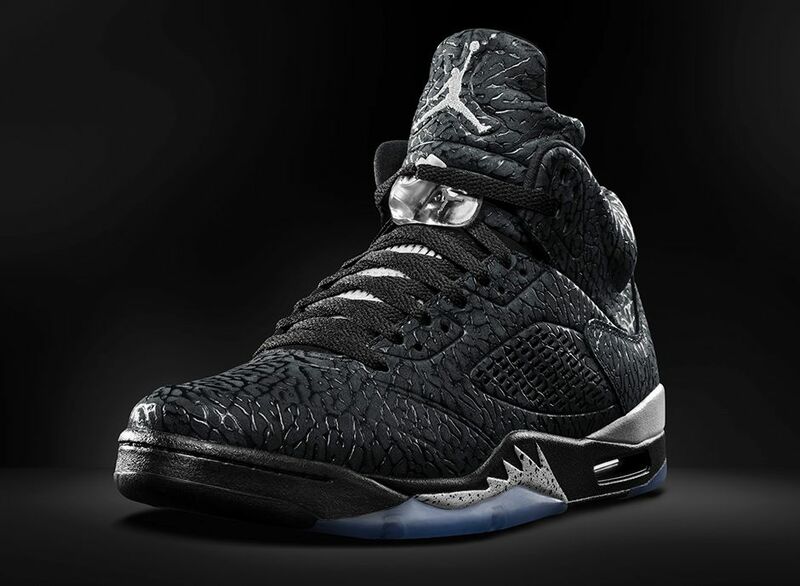 These Jordans have been dubbed the Air Jordan 3LAB5 Black/Metallic Silver. If you’re familiar with the series, they are a Jordan 5 with a bit of a twist on them, as they have a full cement print that covers the whole shoe. The “shark teeth” as you will are a bit different, as they have the silver color with the black paint splatters that seem to have become popular in the sneaker world. My all time favorite Jordan shoe is the 5 model, so I will definitely be trying to snag me a pair on Nike.com, and I definitely suggest that you should too. These have kind of a steep price tag, which comes in at $225. Another great pair that is dropping this weekend that I think a lot of people will sleep on are the great pair of air trainers that are dropping. 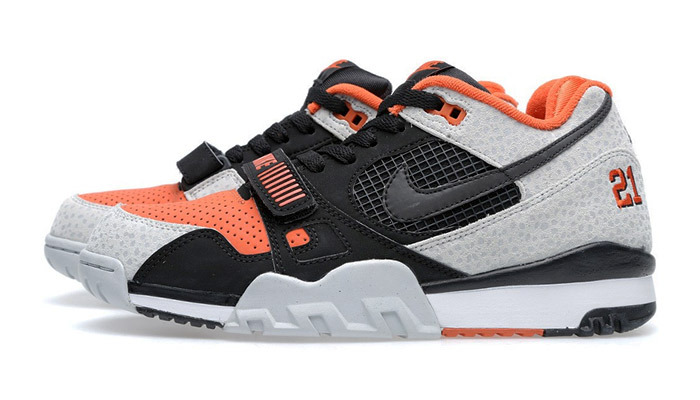 The Nike Air Trainer 2 PRM-Barry Sanders have a great shoe to show off just the man who once wore this design. The team orange color accent really goes well with the wolf grey and black overtone that surround the shoe. Of course, the iconic “21” is stitched on the back of the shoe, reminding those who these awesome shoes were made for. These are definitely a pair of shoes you if you’re looking to have that cool summer vibe that many people love to have. You could throw on jeans or shorts and these will still catch eyes and compliments around the parties y’all probably are going to the look the freshest to. These will be released via Nike.com and they have a price of $130. Good luck in trying to grab a pair. Last but not least are a personal favorite of mine, and frankly, I haven’t seen a colorway on a pair of Air Tech Challenges that I didn’t like. 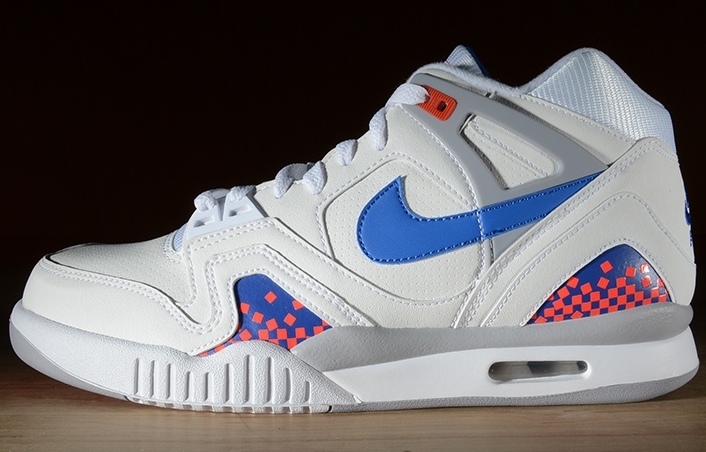 The Nike Air Tech Challenege II- Pixel Court is the perfect definition of simplicity with flair. The shoe itself has a white base with very basic but eye catching designs. The main Nike Swoosh is blue, and towards the bottom of the shoe the design is of blue and red pixels that are interchanging between themselves. The shoe itself really is simple but really effective in the summer feel, as you can definitely see yourself wearing these chillin out with the homies or with your summer love for the moment. These will also be released on Nike.com with the price tag being $120, something that shouldn’t hurt the pockets too much. Thank you guys again for reading and I hope you stay tuned in for next week for my blog post. I hope you guys enjoy reading these as much as I enjoy writing them, and I need you to tell a friend to tell a friend to tell a friend about FlyLittleThings.com. We have some big plans coming up, and I’d hate for the loyal visitors to miss out on them. Signing off, Esco.